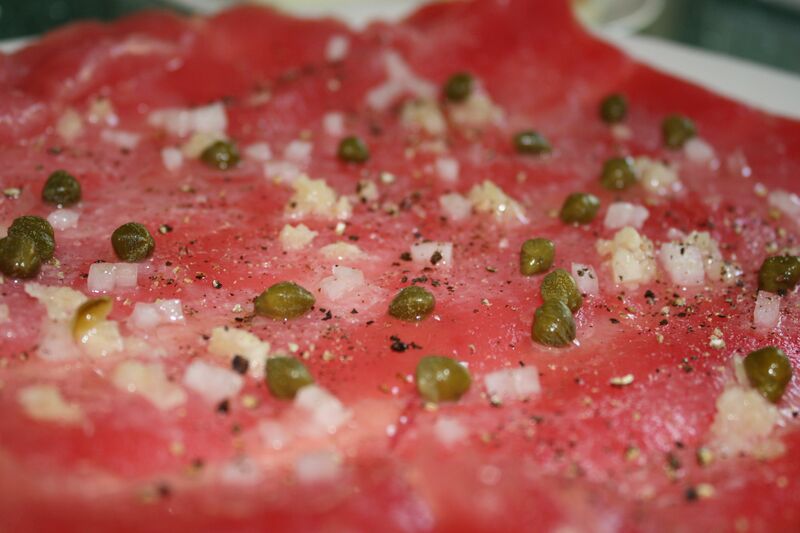 Use the freshest Ahi Tuna or (fresh flash-frozen ahi steak thawed) that you can find. Place tuna between two pieces of plastic wrap and with a rolling pin or mallet, beat until thin and translucent. Peel one side of plastic wrap off and lift remaining plastic wrap with pounded tuna. Invert onto a plate and remove remaining plastic wrap. Squeeze juice from a lime all over tuna surface. Sprinkle minced garlic on top, salt, pepper and capers. Wait 5 minutes and serve with crackers. Looks so simple and delicious! Will have to remember this recipe the next time I get a fresh one from the Gulf! Wow the color is so vibrant!! Perfect for any Ahi tuna lovers! Give this one a try, super good and super easy. I actually had it for breakfast in the city this morning.